Get Rs.125 cash back on DTH recharges of Rs.1000 and above. Coupon code can be used 5 times per user and valid for all users. Coupon is valid on web and application. This coupon is valid till 30-Nov-2015. Get Rs.50 cash back on DTH recharges of Rs.500 and above. Coupon code can be used five times per user. Coupon is valid on the web and mobile application. Get Rs.225 cash back on DTH recharge on minimum recharge of Rs.1000. Promo code can be used once per user per DTH number. Coupon is valid on web & app. 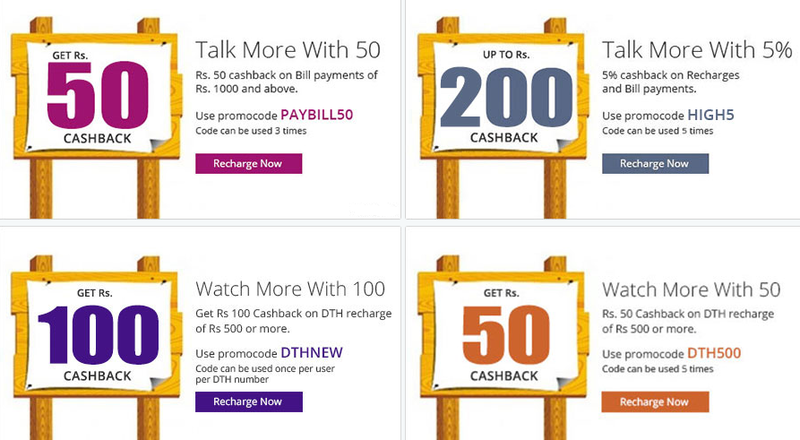 Get Rs.100 cash back on DTH recharges of Rs.500 & above. Coupon code can be used 1 time per user and valid for new users. Get Rs.75 cash back on DTH recharges of Rs.200 or more. Offer is valid for new users only. Offer is not valid for Airtel transactions. Offer is valid only for a transaction is done via Debit & Credit Card only and valid on FREECHARGE app, the web & mobile web. This coupon is valid till 10-Nov-2015. Get flat 5% cash back on minimum transaction of Rs.50. Maximum cash back is Rs.100. Coupon is valid on prepaid, DTH, data card recharges, postpaid, electricity, gas bill payments and metro. Coupon code can be used only once per user. Coupon is not valid for Airtel customers. Get 10% cash back on electricity, postpaid mobile bill payments, DTH & data cards. Maximum cash back is Rs.50. Maximum redemption 2 times per user during the promo period. Get 10% cash back using the MOBIKWIK app. Minimum transaction of Rs.200. Maximum cash back available is Rs.75 per card. This coupon is valid till 14-Nov-2015. Get Rs.50 cash back on Bill payments of Rs.1000 and above. Coupon code can be used 3 times per user. Coupon is valid on web and app. Promo code is not valid for Airtel prepaid users. Get 10% cash back on electricity, postpaid mobile bill payments, DTH & data cards. Maximum cash back is Rs.50. Maximum redemption 2 times per user during the promo period. This coupon is valid till 30-Nov-2015. Get 5% cash back on recharges and bill payments. Coupon is valid on web and application. The code can be used 5 times. Get Rs.50 cash back on bill payments of 1000 and above. Coupon is valid on web and application. The code can be used 3 times.